This connects to the Main, Gallery, Slumbook & Technopengi Pages. 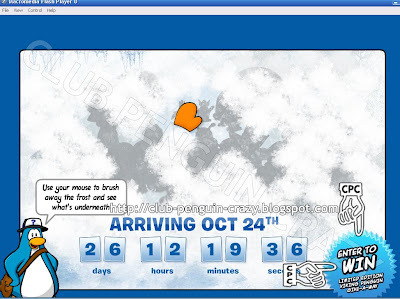 Unbelievable Ultra Secret Event in Club Penguin! I made some tweaking and I unwittingly discovered something! OMG! I am so speechless! This is Ultra Secret! Unbelievable! Since this SWF File is on my computer, I can't see where is the new site! And I doubt the link is up now coz this is supposed to be just a sneak peek. For now, you will NOT see this online/live at the secret link that Billybob gave me. 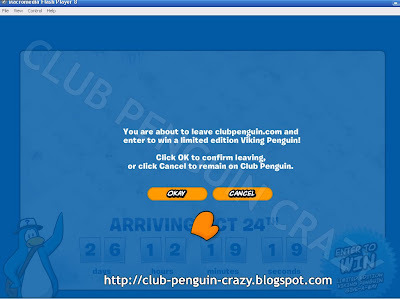 This has never been done before: Club Penguin giving away penguins, a RARE one at that! Woohoo! I want to WIN THIS RARE VIKING PENGUIN! Congratulations! You are ONE of the FIRST ONES out of the Gazillion Penguins on Club Penguin to SEE THIS UNBELIEVABLE ULTRA SECRET EVENT IN CLUB PENGUIN! Go right on it, Inspector! Wahoo!